According to reports in Hong Kong's Mingbao newspaper, while rats are causing an ecological disaster in Dongting Lake, Hunan Province, there are more and more news reports unveiling the habit of eating rats in Guangdong Province. Although the Animal Epidemic Prevention Place of Shenzhen has warned that rats are absolutely unsuitable for eating since they carry many kinds of germs and parasites, they are still sold to restaurants in Shenzhen. A reporter from Jingpao in Shenzhen went to Hubei Market in Dongmen on July 21. He found that many people were selling rats. Rat sellers said that the rats were from Hunan and Guangxi Provinces. 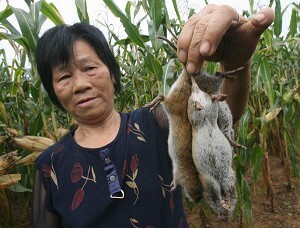 Although selling rats is illegal, it is hard to ban the sale of rats because many people in Shenzhen like to eat them. When the reporter enquired for the price of rats in a wholesale store for wild animal products, the trader hinted that the “the product is available”, but “be quiet”. The trader told the reporter that rats have been sold in the store for a long time; however, control is tighter recently and consequently trading has become more covert. The reporter found that the rats sold in Dongmen were big, weighing about 1 kg each. The trader said that they sell “superior quality” ones which are from Hunan and Guangxi provinces. There are sufficient supplies in Hunan recently, so customers can even place an order if they want to buy a lot. It is not easy to transport rats so the price is quite high, around 100 yuan (approximately US$22.7) per kilogram. The traders also revealed that many restaurants in Shenzhen bought rats from him every day.